Occasionally during a therapy session a client asks for reading material. If I can't think of a specific resource at the moment, I'll grab my laptop or tablet to quickly search online. It usually takes no more than a minute or two to find relevant and reliable information. If there are a lot search results, I'll jot down the search syntax that I used and hand it to the client to explore later. People are going to look things up anyway - which makes it all the more important that we steer them toward high-quality information. 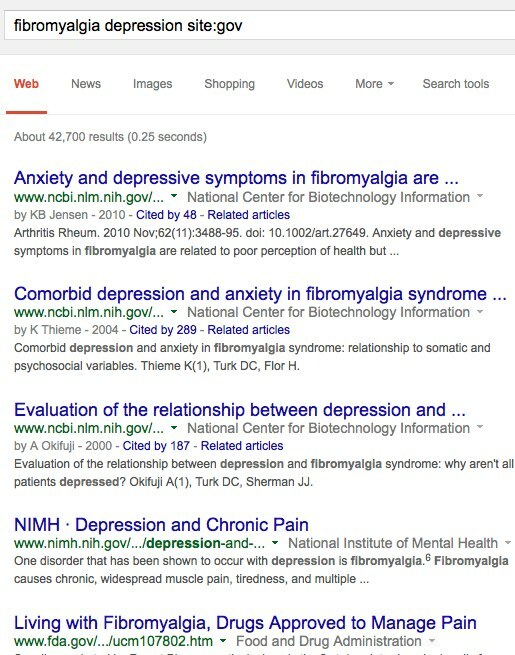 In order to find quality results, I use one or more focused search techniques, depending on the type of information needed. These techniques are not difficult, but most people don't know about them. 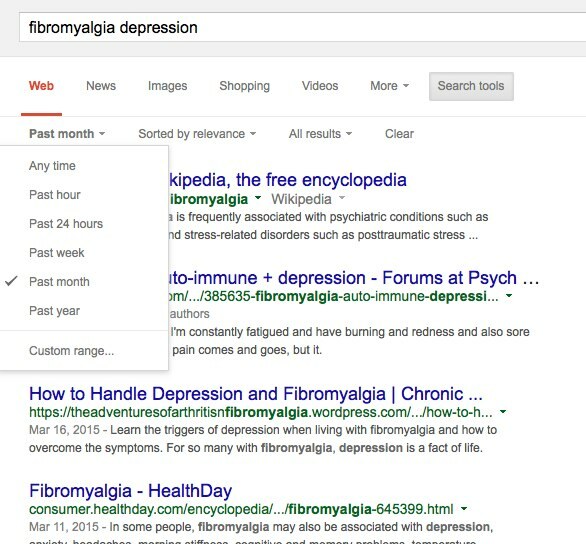 Similarly, to filter from .edu or .org sites, add either site:edu or site:org to your search. If you find that .gov sources are too academic for your client, try .edu or .org. Clients don't always ask for web-based resources. Sometimes they'll request book titles - not just any title that they find on Amazon, but a book that you would recommend. Most of the time you can probably think of one or two titles, just from your own experience and knowledge of the experts. But when you can't, or if you're curious about recent publications, you may be inclined to search on Amazon first, where you'll probably get thousands of hits. Fortunately you can use Amazon's advanced search window, or simply sort the results by publication date, relevance, customer reviews and other variables. 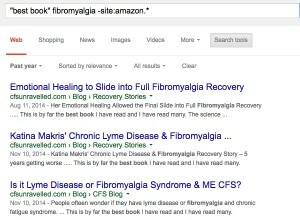 But Amazon search results don't always yield the best books for your client. 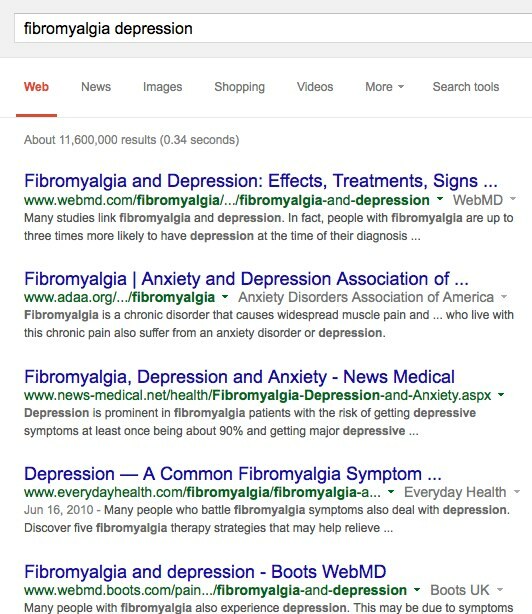 For example, using the search terms fibromyalgia depression and filtering for the most reviews, the book title that appears at the top of the results is by Kevin Trudeau, who has been sued by the Federal Trade Commission for making false statements, and is currently serving a 10-year prison sentence. I put "best book" in quotes, so that Google returns web pages containing that phrase, rather than best and book separately anywhere on the page. Also -site:amazon. * filters out results from amazon.com, amazon.ca, amazon.uk and other country-specific amazon websites. Finally, I limited my search to the past year. This is a good search strategy if you are seeking books personally recommended by professionals and/or by people who have lived with the problem described.